Primary School Nurses are well placed to promote oral health for young children through their contact with many children and their families. Have you heard about the Healthy Together Victoria Achievement Program? The Achievement Program supports schools to create healthier environments and recognises their work to improve the health and wellbeing of their communities. DHSV helped to develop the benchmarks for healthy eating and oral health. This resource is designed to support primary school nurses to promote the importance of good oral health and prevent oral disease. Early detection and intervention regarding health are key to the role of primary school nurses. Eat for health is a one stop shop for information about eating well. It houses the Australian Dietary Guidelines (2013) and includes a range of resources. 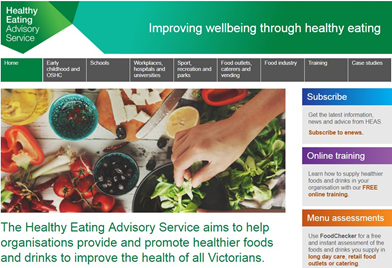 The Healthy Eating Advisory Service, run by Nutrition Australia Victoria Division, offers information and support on food and nutrition and the provision of healthy foods and drinks in schools. An educational video produced by DHSV for parents. Find out how to care for your child's teeth and gums and why it is so important.